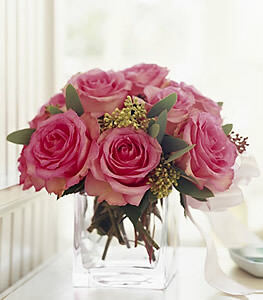 Symbolizing grace and gratitude, these pink roses appear to float like clouds above their vase. Tied with a pale pink ribbon, its a lovely gift for any occasion. A glass cube vase filled with 12 pink roses and eucalyptus arrives tied with a pink ribbon.